Welcome to the Council meeting of the Ontario College of Teachers (the “College”). The following is a list of guidelines that we hope will make your visit enjoyable and informative. some Council documents are confidential and will not be included in the public package. The College will endeavour to accommodate all persons attending a Council meeting; however, priority is given to individuals who registered prior to the meeting. Individuals who do not comply with these requirements may be asked to excuse themselves. Members of the media requiring further information should contact College Communications at 416-961-8800 ext. 647.
litigation affecting the College will be discussed. During closed sessions visitors will be requested to leave the Council meeting. You may wait in the reception area until the public session reconvenes. Exit at Bay or Museum subway stations. Indoor parking is available to the west of the College. 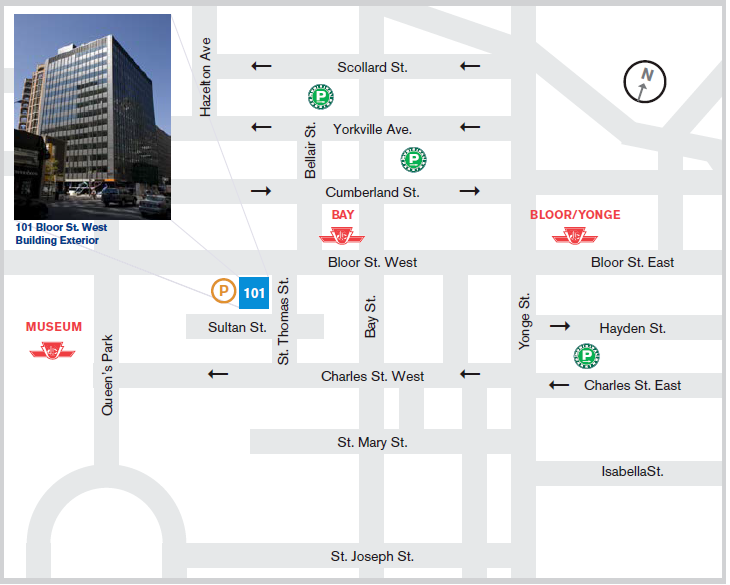 The parking entrance is accessible from Bloor St. West. or Sultan St. Outdoor parking is available within walking distance to the College. The Ontario College of Teachers is wheelchair accessible.